The week may not be half over yet, but plans for the weekend are already filling up. Breweries are hosting tappings, preparing for the Big Beers Festival and seasonal brews are being poured. Have you tried a new craft beer lately? Here's what's happening around the Colorado beerosphere today Tuesday, January 8th, 2013. Epic Brewing (Denver) - Epic Brewing of Utah is planning to open a 2nd location in Denver at 3001 Walnut Street in the RiNo area. This 19,000 square foot building will house a 20bbl brewhouse and taproom and store up to 1,000 wood barrels. Expect production to begin by late March 2013 and open to the public in April 2013. Epic plans to produce their Elevated series of beers and a Classic series of beers. Breckenridge Brewery (Denver) - Something has been released into the world once again. Breckenridge announces their annual release of Pandora's Bock - a great late winter / early spring seasonal with a subtle hop flavor. Available now. Yak & Yeti Brewery (Arvada) - Their Wednesday Porter Series is about to go interactive. You, their patrons, will soon get to vote on which of the weekly porter series were their favorites. The top picks will have repeat sessions. They are also adding 1 more to the porter series later this month - a Chipotle Porter. Stop in to try one soon. Vine Street Pub & Brewery (Denver) - It's taken the last 4 months in a Heaven Hill bourbon barrel, but today they are finally letting it out. Come to a tapping of their Bourbon Barrel-aged Olde Skiddy English Barleywine today at Vine Street. Such a treat will not last long. Stop in before it's gone. Lone Tree Brewing (Lone Tree) - LTBC welcomes in the new year with a new seasonal Belgian Pale Ale tapping set for Wednesday, January 9th at 12pm. Also, now available in 22oz bottles is their LTBC Acres O'Green Irish Red and LTBC Outta Range Pale Ale. Look for them on shelves around the Denver area. Coming on up Wednesday, January 30th will be a tapping of their India Red Ale. Then stay tuned for Valentine's Day as they are prepping to tap their Russian Imperial Stout! Arvada Beer Co (Arvada) - Are you a member of their Mug Club yet? If so, you'll be getting to sample a free mug of their upcoming Wadsworth Weizenbock two days earlier than the release to the public. The beer will officially be tapped to the public on Friday, January 11th. Still time to sign up! Upslope Brewing (Boulder) - Progress on their 2nd brewery location continues. Upslope recently installed new hot and cold liquor tanks and will soon be producing beer at their Flatiron Park location (1898 S. Flatiron Court). The brewery expects this facility to be in full operation sometime this quarter. The new facility will initially expand their capacity by 70% with room for further expansion still. Also, look for their Limited Edition Foreign Style Stout to return this Friday, January 11th in cans. They'll be pouring them at the brewery starting at 2pm Friday. Pateros Creek Brewing Co (Fort Collins) - On Friday, January 11th at 4pm, Pateros Creek will be hosting a vertical tasting of their Sleeping Elephant Winter Warmer. They'll be comparing two different years of this big seasonal brew. If you haven't seen their new expanded taproom yet - you owe it to yourself to check it out! New BelgiumA new series of beer is coming from New Belgium in 22oz bombers. 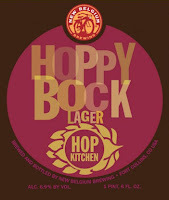 This series entitled: "Hop Kitchen" will feature 4 new brews that will debut in 2013. 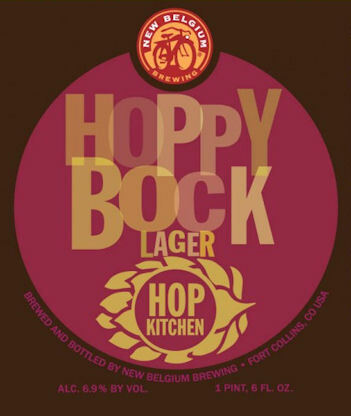 The first of which will be Hoppy Bock Lager - a German-style springtime lager brewed with rye and loaded with Hallertauer, Perle and Fuggle hops for a spicy, earthy aroma. It's medium bodied and slightly sweet malt character will go great for Spring. Look for this series to debut in the near future. Odell Brewing Co(Fort Collins) - Their workers are busy packing up cases and kegs for this weekend's Big Beers Festival in Vail, CO. They plan to bring up some Lugene Chocolate Milk Stout, Friek and The Meddler Oud Bruin Ale. If you're going - be sure to stop by their station and say hello! Echo Brewing Company (Frederick) - For those who excel in the trivial pursuits, Echo Brewing will be hosting a Trivia night tonight starting at 7:00pm. Stop in early, have a pint and grab some food from The Orange Crunch food cart who will be on site from 5:00pm til 8:00pm. Pikes Peak Brewing Co (Monument) - PPBC has a lot planned for this month. Listen to live music every Saturday night from 7pm to 10pm in their new barrel room. Today get $1 off every beer during "Yappy Hour" at 5pm. On Wednesday, January 23rd they will be participating in a Tap Takeover at Brewer's Republic. Then chow down at their Brewers Dinner at Rudy's Roadhouse on January 26th. Colorado Craft Beer Show (AM 760) - Due to the CU-UCLA basketball game, the weekly craft beer radio program will start late around 2:30pm and run until 5:00pm. This week, they will be broadcasting live from the Big Beers Festival up in Vail, Colorado. Parry's Pizza (Castle Rock) - This Wednesday at their Castle Rock location Parry's will be tapping a special beer and launching their very first Trivia night. They will have all CO beers for $1 off during trivia, $1.00 off all appetizers (excluding wings) and of course Parry's Pints which are all $3. Great beer, food and trivia, now every Wed. night from 7pm - 9pm in Castle Rock. High Gravity Homebrewing Supplies (Tulsa, OK) - See their sponsor link along the right column of the blog? If you click on it and order any beer ingredient kit this month - you can get a 10% discount when you use the code NewYear13 when checking out. This also includes Winexpert wine kits (excluded limited edition kits).